The main function of the Gate Intercom systems is to allow remote control of the gate itself. 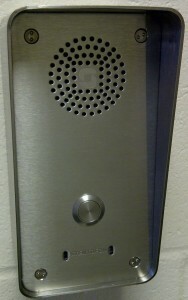 The intercom unit is normally linked back to a central control room or reception; from here, the guard can answer the call and remotely release the gate lock if required. The Gate Intercom system has an inbuilt rely which can be controlled from the guard’s location to give a contact closure for electronic gate lock mechanisms. For added security, there is also the option of linking the intercom station to the CCTV system to allow the guard to see who is at the gate. This allows you to more accurately identify those wishing to enter, giving an added degree of protection. A Gate Intercom station is normally a single button unit which is designed to be used as part of a gateway entrance. These units are easy to use for those wishing to enter, as well as being highly weather resistant and durable in all conditions. This makes them reliable in both internal and external locations. Depending on requirements, the gate intercom system can be surface or flush fitting, letting you choose the option which suits your location the best.